An ectopic pregnancy is an extrauterine pregnancy. 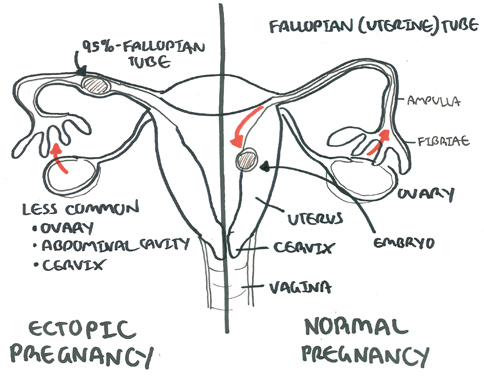 Almost all ectopic pregnancies occur in the fallopian tube (>95%). Remember The most common site for ectopic pregnancies is a fallopian tube. 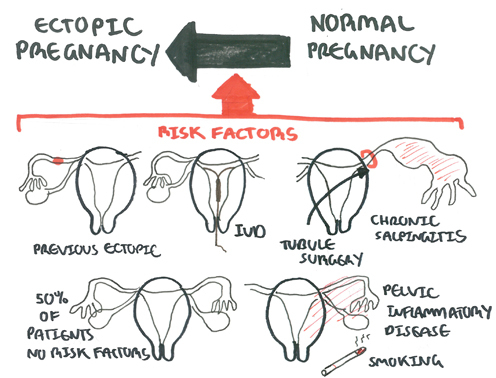 More than half of patients with ectopic pregnancy have no risk factors. Clinical Presentation differs if the patient has an ectopic or an ruptured ectopic. 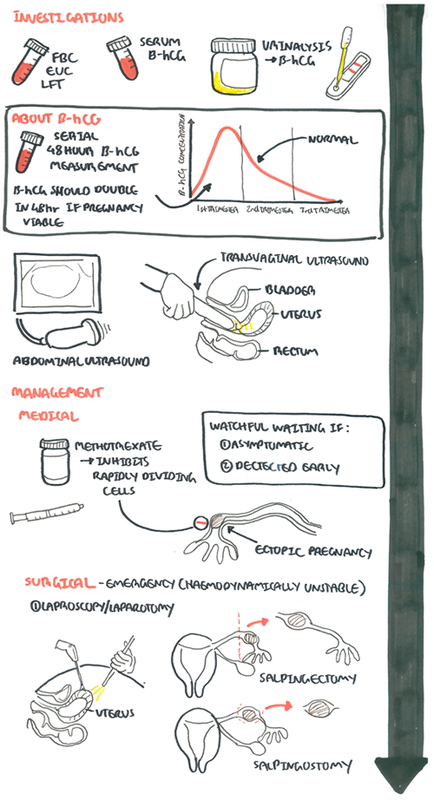 Ectopic Pregnancy is often asymptomatic. 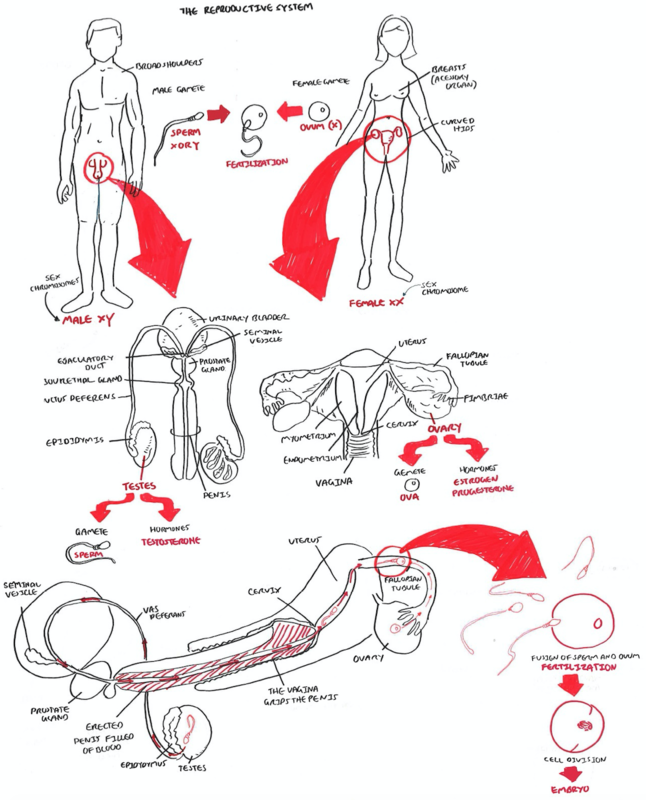 Pelvic pain and tenderness (palpation and bimanual examination). 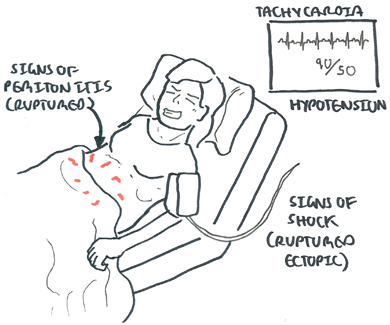 If rupture of ectopic occurs, there is blood, acute abdomen with increasing pain (+/- shoulder tip pain), abdominal distention and signs of shock. 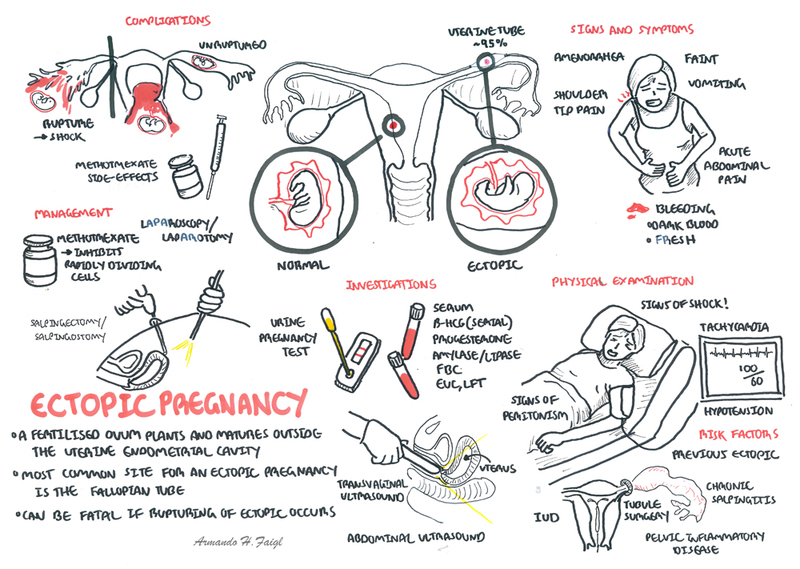 Ectopic Pregnancy Triad: amenorrhea, vaginal spotting, and abdominal pain. 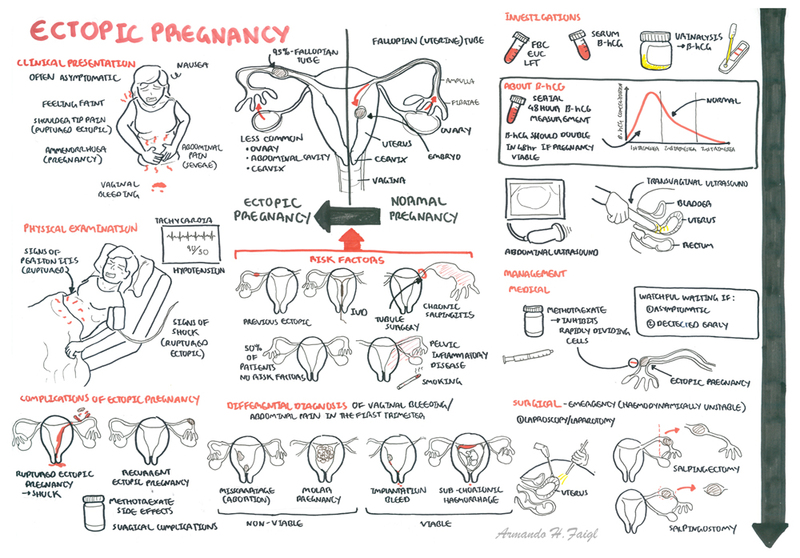 Remember Rule out ectopic pregnancy in a female patient in reproductive age who presents with an acute abdomen regardless of history and examination findings. 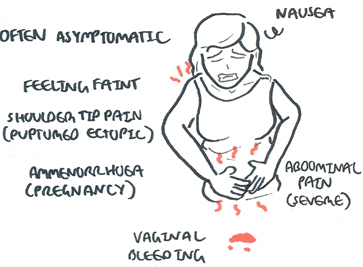 Pain is the most common complaint +/- vaginal bleeding. A ruptured atopic will present with signs of shock and signs of peritonism. 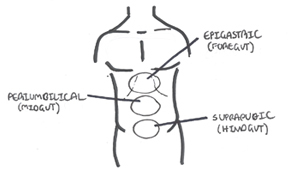 Pain can be divided as being epigastric, umbilical or suprapubic (hypogastric). Ectopic typically presents as suprapubic pain but may radiate to other areas, especially if ruptured. 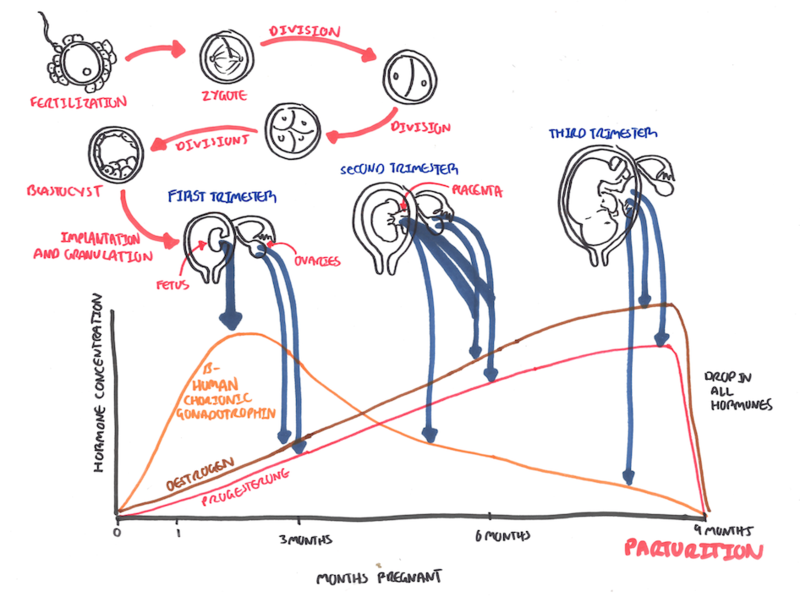 Referred pain is important to understand. 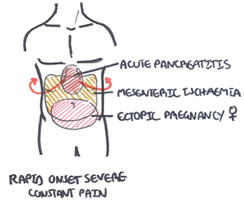 Certain areas of the abdomen can refer pain else where. A good example is in ectopic pregnancy when irritation of the diaphragm can cause shoulder tip pain. Remember Levels of hCG that plateau in the first 8 weeks of pregnancy indicate an abnormal pregnancy, which may either be a miscarriage or an ectopic pregnancy. 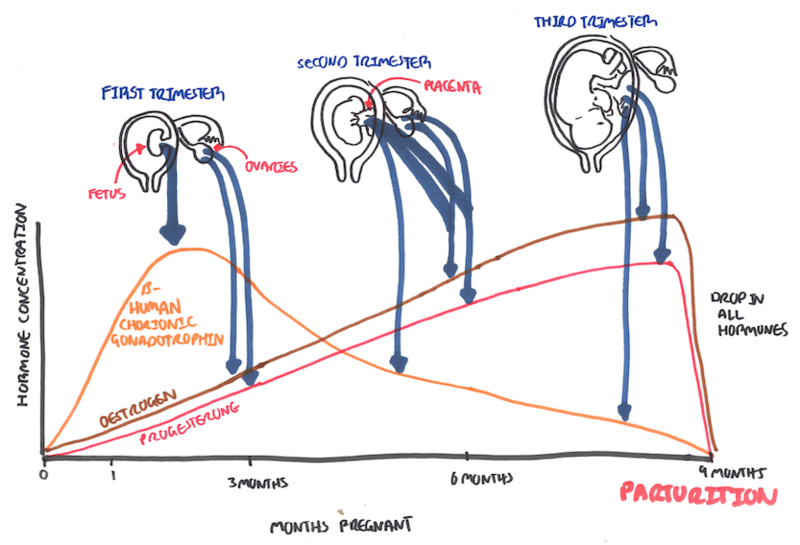 Hormonal changes in pregnancy. Note First trimester bHCG peaks then drops steadily. b-HCG is decreasing failed pregnancy (eg, spontaneous abortion, tubal abortion, spontaneously resolving ectopic pregnancy). Management option depends on clinical presentation and setting. Emergency setting where the patient is haemodynamically unstable will be discussed in the next section. 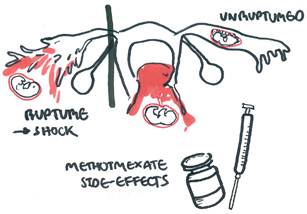 Methotrexate therapy The optimal candidates for MTX treatment of ectopic pregnancy are hemodynamically stable, willing and able to comply with post-treatment follow-up, have a human chorionic gonadotropin (hCG) concentration ≤5000/mL, and no fetal cardiac activity. Pharmacology Methotrexate is a folic acid antagonist widely used for treatment of neoplasia, severe psoriasis and Rheumatoid arthritis. Side effects of methotrexate is conjunctivitis and gastrointestinal upset.